“Oh, that’s Bob,” I said. He looked as surprised as I was when I was thirteen. My Mom, my Dad and I had returned to England for the first time since we immigrated when I was three. We drove past an old airbase. “That’s where Bob was stationed,” my Mom said. I was shocked, immediately thinking my Mom was divorced and I didn’t know it. She was sure she had mentioned her first husband to me before, but I don’t think she ever did. People of her generation didn’t like to talk about the war. My mother’s family lived in a thatched cottage in the village of Abbington Piggotts. During World War two, every Sunday, my grandmother would host teas for the “boys” from the 57 squadron at the nearby air base. Sometimes my mother would come home from London, where she worked, for a visit. During one of those weekend visits, she met Bob Durham. Robert Durham and Mary Oxenford married on January 23, 1943 in Cambridge, England. Just over four months later, Bob was transferred to squadron 12. On June 12, Bob’s plane took off from the base. It was shot down over Northern Holland. Bob and the crew were reported missing. My mother insisted that Bob came to her in a dream. He stood before her and said, “Don’t worry Mary, I’m all right.” That was when she knew he was dead. All the crew except one died and Bob was one of the dead. Bob was given a Distinguished Flying Medal, posthumously. My mother gave her engagement and wedding rings to Bob’s mother. She said they had been married for such a short time and his Mother was devastated to lose her son. 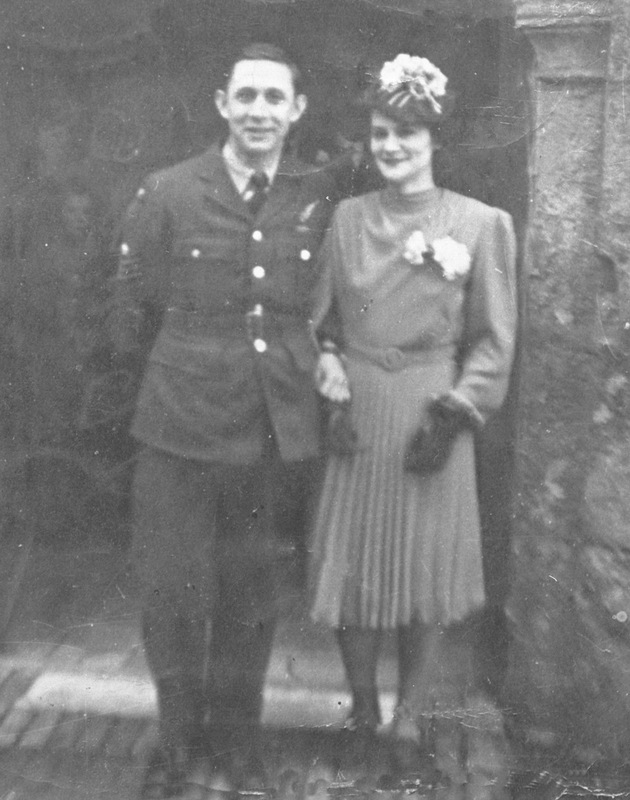 Seven years later, after the war was over, my mother met my father, who had also been in the air force. They had a very happy marriage for 24 years when my mother was widowed again, this time from my Dad’s death from cancer. This is not the end of this story. My husband’s genealogy hobby occasionally throws up connections and touching moments. This past April, he got a message from an Anne Durham researching the history of her father’s brother. Ancestry.com flags names that might be of interest to members. John had just put up Bob Durham’s name by my mother’s. She wondered if Mary’s daughter, me, knew about Bob. She didn’t want to cause distress. Sadly, Bob’s younger brother, her father, had died when she was nine. She knew very little about his elder brother who had died in the war. Typical of the time, the children were told not to ask their Grandmother about her eldest son, as it upset her. Time and again, John has found this problem in his research. She wondered, did we know anything about how they met? Fortunately, after my thirteen year old shock, my mother had told me her first love story and I remembered. We were able to send her two pictures of the wedding and she sent us a picture of my mother and her grandmother after Bob’s death. 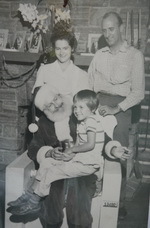 My Mom in happier times with my Dad and me. Visiting Santa at Bracebridge Ont. the public school board and now the Region of Waterloo. For me, it’s not a political thing. On Monday, I will remember my Dad and my father-in-law who survived and my husband’s uncle and Bob who did not. For many years, I thought I was the only one who remembered Bob. It’s good to know there is someone else on the other side of the ocean who remembers too. This entry was posted in Uncategorized and tagged Air Force, ancestry.com, Mary Grey, Mary Oxenford, RAF, Remembrance Day, Robert Durham, Second World War, World War Two. Bookmark the permalink. This was very touching and personal. Thanks, Jane! A beautiful story about a beautiful lady.